It's back; The dreaded time where the Summer holidays are over and it's time to make your way back into the classrooms. I'm obviously talking about everyone going back to school, and whether you're just starting a new year, or starting at a new school all together, it can be a bit depressing after such a long holiday. So to make things just a little more fun for your first day back, I've put together a bunch of gorgeous backpacks that you're definitely going to want to grab! I absolutely love the patterned BooHoo backpack as the colours are just so bright an fun, and you can't beat the cute landmark print as seen from ModCloth. Keeping on the same line as fun colours and prints, this Herschel Supply backpack is a definite keeper, the two clashing prints, paired with the neutral backdrop makes this perfect for everyday use, but is definitely not boring! However my all time favourite, and the backpack I would choose (if I was still at school) has got to be this stunning, studded one from BooHoo. Not only is the shape a bit different, but it is also SO big, so plenty of rooms for your books and thing! The black and gold is a definite classic combination, which won't grow old, and the studs and straps add a bit of an edge, which you otherwise might not be able to get with a school backpack. 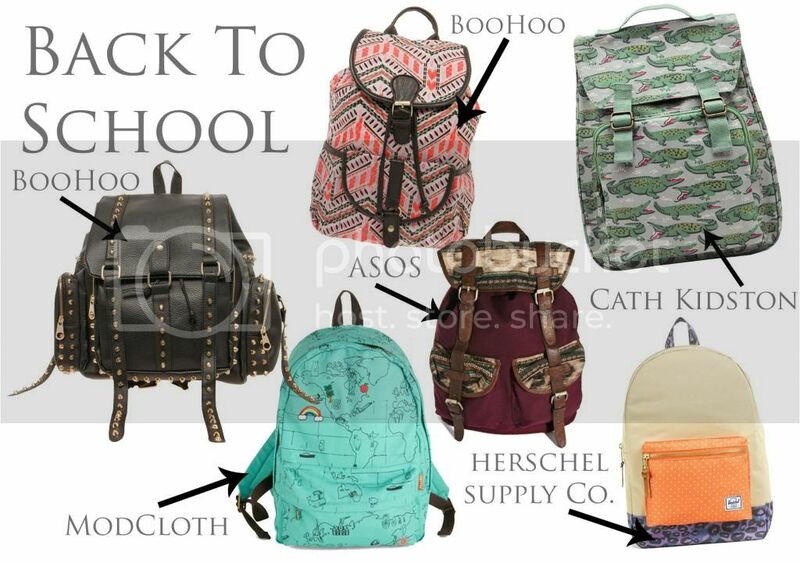 What backpack do you like the best? And when do you all go back to school!? I know it's different times for everyone, but regardless, enjoy your first day back!